Congratulations to Pacific Northwest National Laboratory's Yuehe Lin and Glen Fryxell on being quoted on nanotechnology research in the June 2008 issue of CEP Magazine, published by the American Institute of Chemical Engineers. This trade magazine is sent to more than 32,000 industrial, academic, and government professionals each month. The article, titled "Nanosensors: Evolution, Not Revolution...Yet," discusses the advantages offered by nanomaterials for sensing, including larger surface area, enhanced electrical conductivity, greater reactivity, and catalytic efficiency. The 5-page article quotes Lin and Fryxell regarding the advancing scientific frontiers and the potential hurdles to commercialization and mass production. Lin was quoted as to the promises of nanotechnology-enabled sensors, and his contributions to sensors based on carbon nanotube arrays, nanoporous silica, and quantum dots were highlighted. In addition, he discussed technical challenges of commercialization, including long-term stability of nano-bio interface for nanosensors with enzymes or antibodies as bio-recognition components. Finally, he discussed issues or lack thereof regarding cost. Fryxell was quoted on his contributions to thin-film nanosensors and the Laboratory's work with PANalytical in the Netherlands to develop films that improve heavy metal detection with the scientific technique of x-ray fluorescence. His work on the lead sensor based on SAMMSTM was also featured. 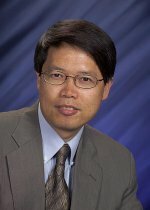 Lin works for PNNL's Fundamental & Computational Sciences Directorate and is a key participant in the Laboratory's Environmental Biomarkers Initiative and Transformational Materials Science Initiative. Fryxell works for PNNL's Energy and Environment Directorate. Both men are both members of PNNL's Institute for Integrated Catalysis.